Fr. 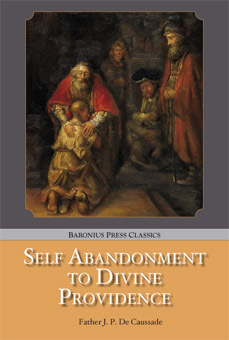 Caussade’s Self Abandonment to Divine Providence is a book for all those who in the words of St. Benedict, “Truly seek God”. Fr. Caussades’s spiritual teaching was derived from two extremely pure sources, St. Francis de Sales and St. John of the Cross. Another source of influence on Caussade were his penitents, the Nuns of the Visitation. Fr. Caussade effectively synthesizes both Salesian and Carmelite traditions in this book, which is comprised of his letters and dialogues on prayer. Fr. Caussade refers to the Salesian teaching of self-abandonment and simplicity, and the Carmelite emphasis on grace as a dynamic force that enlightens and cleanses the soul. When speaking of death to self, he refers to “abandonment” “trust” and “acquiescence”. He impresses upon the reader, that abandonment may be taught and practiced by repeated acts. It is the duty of every Christian to acquire this virtue.